When the triumphant Donald Trump moved into his White House Office he immediately replaced the deep red curtains of the Obama presidency with bright gold curtains, and Obama’s rug, inscribed with a quote from Martin Luther King, with one of a golden sunburst. These decorations reflect the opulence of the new President’s $100 million penthouse apartment in Trump Tower. The apartment is his Versailles fantasy, where the oversized mirrors, picture-frames and furnishings speak of the wealth and power of America’s new Sun King, his White House rug hinting at the first Sun King, Louis XIV, the builder of the real Versailles. The real Versailles is on display until 17 April in the current National Gallery of Australia ‘blockbuster’ exhibition Versailles. Treasures from the Palace. The exhibition of more than 130 pieces is a stunning array of brilliant craftsmanship, almost all from the Museum of Versailles itself and from the Louvre. The objects in the exhibition have not left France – or even Versailles – before. It is a triumph for the NGA and for its Director, our distinguished alumnus Dr Gerard Vaughan. The objects on display range from the court painter Hyacinthe Rigaud’s famous portrait of Louis XIV (1712) to huge, ornamental vases in marble, porphyry and bronze which bordered the extensive waterworks at Versailles. There are exquisite pieces of Marie-Antoinette’s ‘Pearls and cornflowers’ service from the Royal Porcelain Factory of Sèvres. The highlight of the exhibition is probably the two-metre high marble carving of Latona and her children sculpted in 1668-70 for the vast Latona fountain by the Marsy brothers, weighing 1.5 tonnes. Ten million tourists flock to Versailles annually to imagine courtly life in such sumptuous surroundings. Versailles was about awesome royal power, intense rivalries, brilliant craftsmanship and engineering, and – for those who did the manual labour – drudgery and deference. Above all, Versailles embodied the claims to absolute and divinely-sanctioned kingship. The construction of the palace at Versailles was the initiative of Louis XIV (born 1638, king of France 1643-1715). The project lasted a half-century, from about 1660 to 1715, and was never really complete, but by 1682 sufficient work had been done for Louis to move his capital there from Paris. At the death of the Sun King in 1715, the village of Versailles – with a population of just 1,000 at the time of his accession in 1643 – had turned into a city of approximately 30,000 inhabitants, most of them serving the nobility. 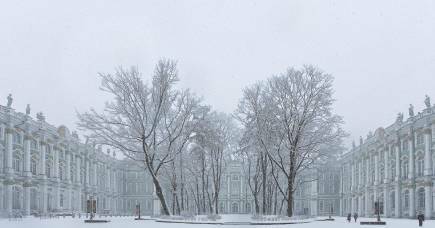 The final cost of the palace, with its 700 rooms, 1,250 fireplaces and garden façade of 575 metres is impossible to ascertain, since much of the manual labour was done by soldiers when not at war. But it was certainly several billions in today’s terms – and as much again has been spent on restoration since 1950. 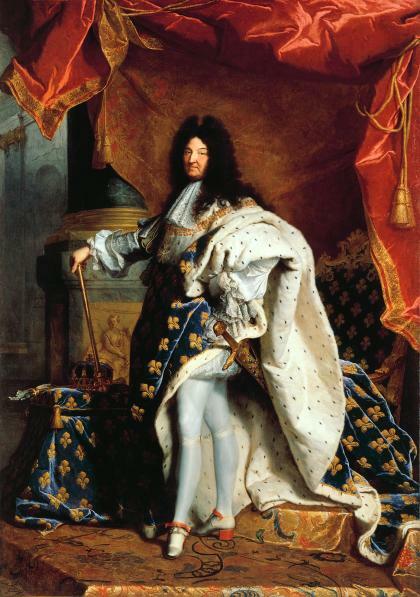 As a boy-king of 10 in 1648, Louis XIV was to endure five years of brutal civil wars (the ‘Fronde’) between aristocratic factions and their retinues contesting royal power. Two key players in the Fronde were older, close relatives of Louis XIV. One of Louis XIV’s intentions in constructing Versailles was to undermine the chance of another Fronde by requiring his most powerful noble families to spend part of each year at the palace, ‘in a gilded cage’ as one of them quipped. So from the Fronde emerged absolute or ‘divine right’ monarchy and centralised, hierarchical government, and Versailles was to be their architectural form. The finest portraits in the exhibition are a series by the court painter Élisabeth Louise Vigée le Brun, of Queen Marie-Antoinette and two of her most eminent ladies at court, the Duchesse de Polignac and the Comtesse de Ségur. There are portraits of Louis XV’s mistress Madame de Pompadour as the ‘beautiful gardener’, and of her successor Madame du Barry as ‘Flora’. 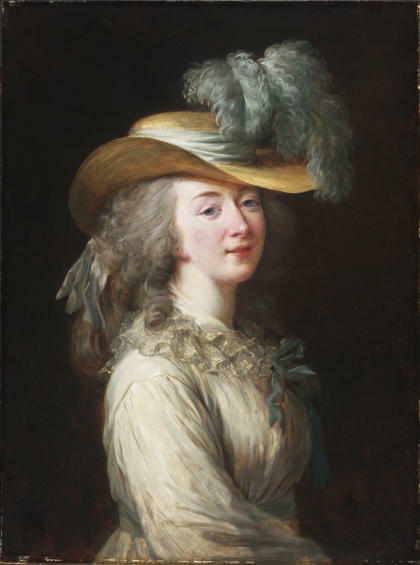 Du Barry, like Marie-Antoinette, lost her life during the French Revolution, the shadow of which looms over the exhibition. The cost of the court at Versailles in the late-eighteenth century was about 10 per cent of the annual tax revenues of the crown. By the late 1780s Louis XVI’s financial crisis – we would call it a sovereign debt crisis – was such that he was impelled to call an Estates-General of representatives of all social orders, the first time since 1614, and something Louis XIV and Louis XV had never had to do. One of the most significant objects in the exhibition is a small (66 x 101 cm) pen and sepia wash painting done in 1791 by the greatest painter of the age, Jacques-Louis David, ‘The Oath of the Tennis Court at Versailles, 20 June 1789’, the first great act of the French Revolution, when commoner deputies to a national consultation (the Estates-General) convened by Louis XVI took an oath to act as a parliament and to draft a constitution. Less than four years later, Louis would go to the guillotine. Versailles would thereafter be a museum rather than a capital. Versailles was the location of two seismic shifts in political culture, from provincial aristocratic power to absolute monarchy after the ‘Fronde’ and then to popular sovereignty and democracy in the French Revolution. Treasures from the Palace is a precious opportunity to relish both astonishing skill in the creation of objects and to ponder the politics of magnificent displays of opulence and power. Emeritus Professor Peter McPhee was the inaugural Provost at the University of Melbourne. He has published widely on the history of modern France, notably A Social History of France 1780-1880 (London, 1992), Revolution and Environment in Southern France, 1780-1830 (Oxford, 1999), and Living The French Revolution 1789-1799 (Basingstoke, 2006). He remains an active researcher and teacher. Big business uses artificial intelligence like regulation technology, or RegTech, to go through the fine print of contracts to ensure compliance - but isn’t it time the technology was used to protect customers?